French cat names make a great choice if you are looking for a unique cat name. A French name will work great for both female and male cat cats. So check the names for male cats listed here and see if you can find a French cat name to your liking. From the well-known names, such as Pierre or Gustave, to lesser known French monikers, you will find a wide selection of names here. Whether you cat is an elegant French cat or a cool American kitty, the names below may fit them just right. Below you will also find a few gift ideas. Did you like any of the French cat names listed here? French names have a nice ring to them. Yes, they might be a bit difficult to pronounce for some of us, but they're surely cool. If you need additional cat name ideas, check the links below. And if you are looking for a French name for your female cat, check our page about French names for cat girls, here. --French for Cats: All the French Your Cat Will Ever Need (Hardcover) by Henry Beard. This is a great pick if you're planning on a French vacation with your cat. --French Cats Don't Get Fat: The Secrets of La Cuisine Feline by Henry Beard and Susan Jones (Illustrator). This is another great read. 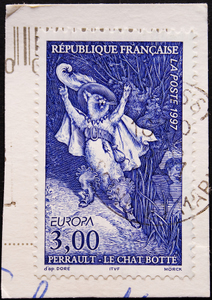 --You can also give posters and prints featuring French cats.